Try our Chatoyant Quartz Specimens Satisfaction Guarantee - compare our prices and our superior quality. Click on any natural chatoyant quartz mineral specimen image below to enlarge it. Cats Eye Quartz Rough Dimensions: 3.6" x 2.4" x 1.3"
This specimen of natural cats eye quartz was mined in Brazil in 1996. It is completely natural, with no treatments of any kind. The cats eye quartz has some white quartz lenses here and there within the gray cat's eye quartz. 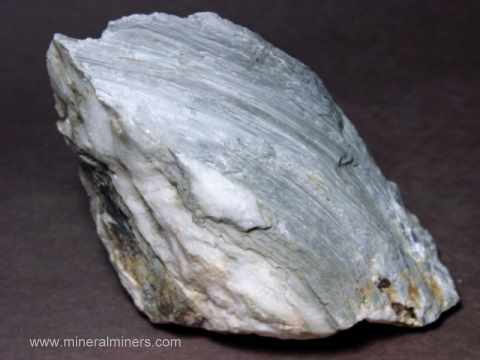 It has a brown oxidized outer surface with fresh surfaces showing gray actinolite fibers encased by quartz. This material yields very nice silver color chatoyancy when properly oriented and polished. This cats eye quartz piece makes a nice specimen of natural cats eye quartz just as it is, although it does have lapidary grade areas that would yield over 200 carats of cats eye quartz gemstones. Cats Eye Quartz Rough Dimensions: 4.5" x 2.2" x 1.8"
This specimen of natural cats eye quartz was mined in Brazil in 1996. It is completely natural, with no treatments of any kind. The cats eye quartz has some white quartz lenses here and there within the gray cat's eye quartz. 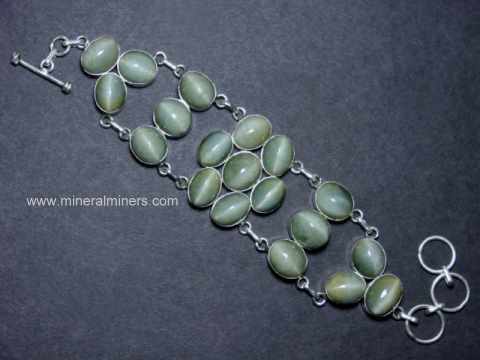 It has a brown oxidized outer surface with fresh surfaces showing gray actinolite in quartz. This material yields very nice silver color chatoyancy when properly oriented and polished. This cats eye quartz piece makes a nice specimen of natural cats eye quartz just as it is, although it does have lapidary grade areas that would yield over 200 carats of cats eye quartz gemstones. Cats Eye Quartz Rough Dimensions: 3.7" x 3.2" x 2.8"
This specimen of natural cats eye quartz was mined in Brazil in 1996. It is completely natural, with no treatments of any kind. The cats eye quartz has some white quartz lenses here and there within the gray cat's eye quartz. 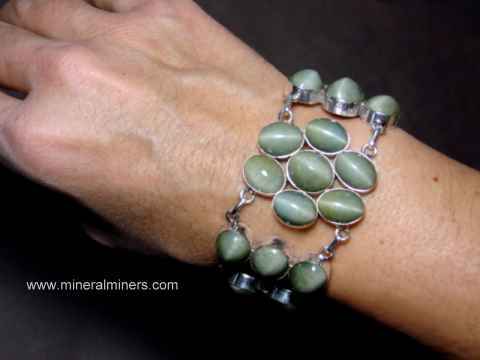 It has a brown oxidized outer surface with fresh surfaces showing gray actinolite in quartz. This material yields very nice silver color chatoyancy when properly oriented and polished. This cats eye quartz piece makes a nice specimen of natural cats eye quartz just as it is, although it does have lapidary grade areas that would yield over 250 carats of cats eye quartz gemstones. Cats Eye Quartz Rough Dimensions: 4" x 3.3" x 2"
This specimen of natural cats eye quartz was mined in Bahia, Brazil in 1996. It is completely natural, with no treatments of any kind. The cats eye quartz has some white quartz lenses here and there within the gray cat's eye quartz. 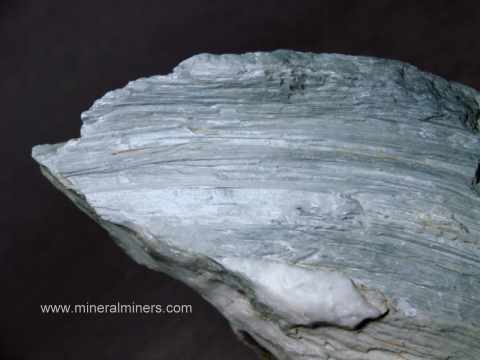 It has a brown oxidized outer surface with fresh surfaces showing gray actinolite fibers encased by quartz. This material yields very nice silver color chatoyancy when properly oriented and polished. This cats eye quartz piece makes a nice specimen of natural cats eye quartz just as it is, although it does have lapidary grade areas that would yield beautiful cats eye quartz gemstones. Cats Eye Quartz Rough Dimensions: 3.8" x 3.2" x 2.1"
This natural specimen of cats eye quartz was mined in Bahia, Brazil in 1996. It is completely natural, with no treatments of any kind. This material has silver color chatoyancy when properly oriented and polished. 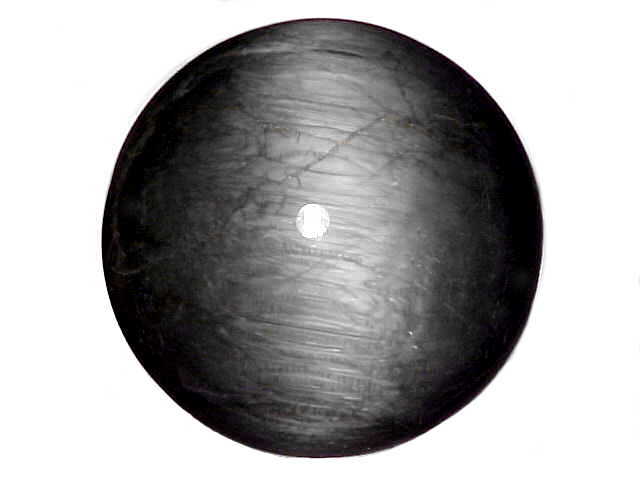 This cats eye quartz specimen is lapidary grade and would yield a 1.7 inch diameter sphere with plenty of material left over for making cats eye quartz cabochon gems. Cats Eye Quartz Rough Dimensions: 5.5" x 3.4" x 2.1"
This specimen of natural cats eye quartz was mined in Bahia, Brazil in 1996. It is completely natural, with no treatments of any kind. The cats eye quartz has some white quartz lenses intergrown within the gray cat's eye quartz. This specimen has a brown oxidized outer surface with fresh surfaces showing light gray actinolite fibers encased by quartz. This material yields silver color chatoyancy when properly oriented and polished. This cats eye quartz piece makes a nice specimen of natural cats eye quartz just as it is, although it is lapidary grade and would yield a couple of 1.5 inch diameter spheres with lots of material left over for making cats eye quartz cabochon gems. Cats Eye Quartz Rough Dimensions: 6" x 4" x 3"
This specimen of natural cats eye quartz was mined in Bahia, Brazil in 1996. It is completely natural, with no treatments of any kind. The cats eye quartz has some thick white milky quartz lenses intergrown within the silvery-gray cat's eye quartz. This material yields silver color chatoyancy when properly oriented and polished. This cats eye quartz piece makes a nice specimen of natural cats eye quartz just as it is, although it is lapidary grade and would yield a 2 inch diameter sphere of intergrown cats eye quartz with milky quartz. See also an opposite side view of this cats eye quartz rough specimen. Cats Eye Quartz Rough Dimensions: 6.2" x 3.5" x 3"
This specimen of natural cats eye quartz was mined in Bahia, Brazil in 1996. It is completely natural, with no treatments of any kind. The cats eye quartz has some white quartz lenses intergrown within the gray cat's eye quartz. This specimen has a brown oxidized outer surface with fresh surfaces showing gray actinolite fibers encased by quartz. This material yields great silver color chatoyancy when properly oriented and polished. This cats eye quartz piece makes a nice specimen of natural cats eye quartz just as it is, although it is lapidary grade and would yield a couple of 2 inch diameter spheres with plenty of material left over for making cats eye quartz cabochon gems. Cats Eye Quartz Rough Dimensions: 8" x 6.5" x 5.5"
This large specimen of natural cats eye quartz was mined in Bahia, Brazil in 1996. It is completely natural, with no treatments of any kind. 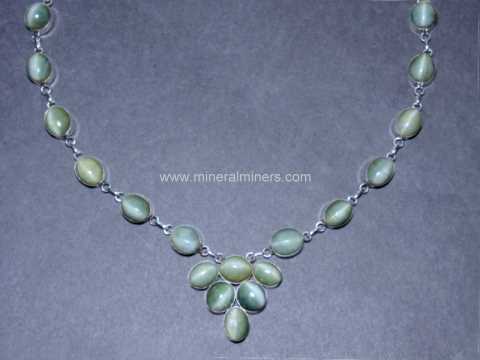 The cats eye quartz has some white quartz lenses intergrown within the gray cat's eye quartz. This specimen has a brown oxidized outer surface with fresh surfaces showing gray actinolite fibers encased by quartz. The photo at left is a close-up of a fresh surface. See a full view photo of this natural cats eye quartz rough. This material has great silver color chatoyancy when properly oriented and polished. See also a side view photo of this genuine cats eye quartz specimen. This cats eye quartz specimen is lapidary grade and would yield a very large wonderful carving or a couple of 3 inch diameter spheres with plenty of material left over for making cats eye quartz cabochon gems. Cats Eye Quartz Rough Dimensions: 8" x 6" x 5"
This large specimen of natural cats eye quartz was mined in Bahia, Brazil in 1996. It is completely natural, with no treatments of any kind. The cats eye quartz has some white quartz lenses intergrown within the gray cat's eye quartz. This specimen has a brown oxidized outer surface with fresh surfaces showing gray actinolite fibers encased by quartz. This material has very nice silver color chatoyancy when properly oriented and polished. This cats eye quartz specimen is lapidary grade and would yield a 4 inch diameter sphere with material left over for making a fine 2 inch diameter sphere and lots of cats eye quartz cabochon gems. Our Chatoyant Quartz Mineral Specimens are 100% Natural cats eye quartz! The chatoyancy or cat's eye effect visible in our natural cats eye quartz mineral specimens is due to the presence of fibrous mineral inclusions or tubelike cavities in parallel orientation within the quartz. These parallel oriented features reflect light at certain angles forming of a brighter zone which moves across the surface of the material as it is turned. 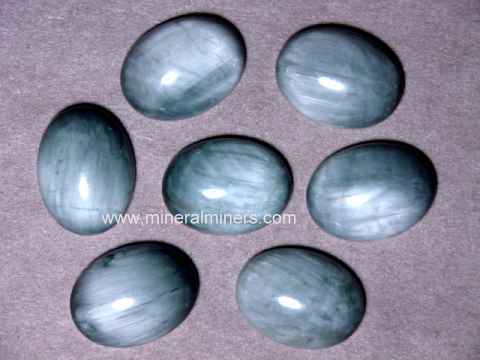 When fashioned with a rounded surface or cabochon shape, this cat's eye effect becomes easily visible. For more information about natural cats eye quartz and its history, physical properties, chemistry, occurance, and metaphysical uses be sure to see our cats eye quartz information page. 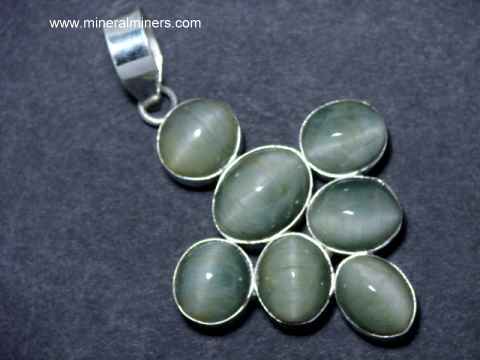 To see more Cats Eye Quartz photos, just select another link below. To see photos of another mineral variety, select any link in our Mineral Inventory & Factsheet Index. Would you like us to inform you when we add more natural chatoyant quartz crystal (also known as cats eye quartz) specimens on this page? We literally have tons of natural chatoyant quartz crystal in stock at our mineral warehouses, so be sure to let us know if you have any cat's eye quartz specimens special requests. Please contact our webmaster or our 'site' geologist with any questions or comments.